BOOK ONLINE RESERVATIONS FOR $100 DISCOUNT!! Aloha! 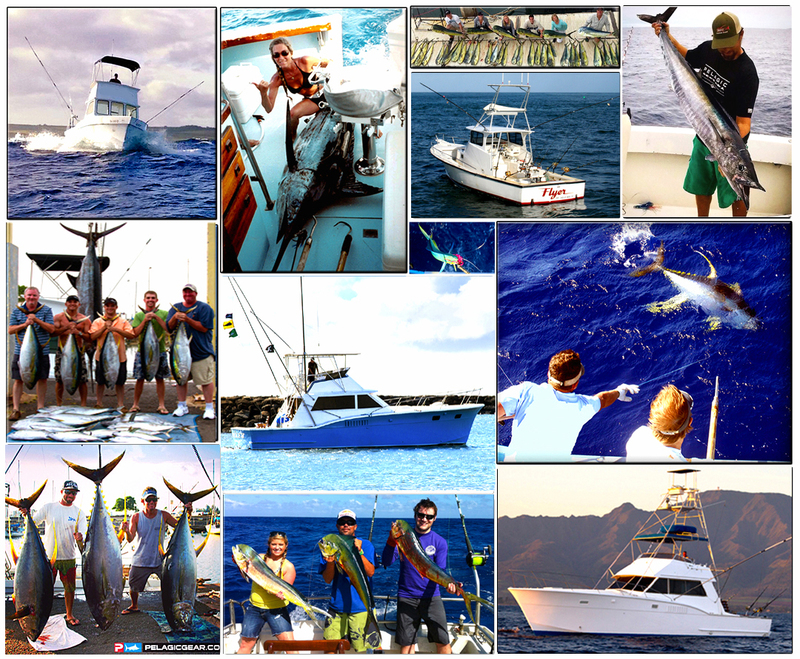 Come to Haleiwa and spend a day with Chupu Sport Fishing in the world famous North Shore waters! Your action-packed Hawaiian sport fishing charter departs daily from picturesque Haleiwa Harbor. The deep sea sportfishing on Oahu is amazing and something everyone should experience. And a deep sea fishing trip from Haleiwa is the best location in Hawaii to do it from. When you combine our experienced captains and crews, the biggest, fastest, cleanest boats in the harbor with some of the best fishing grounds found anywhere in the world you have a recipe for offshore fishing success. Our boats have everything you need onboard to experience a one-of-a-kind and maybe a once-in-a-lifetime big game sportfishing adventure in Hawaii. We look forward to fishing with you! 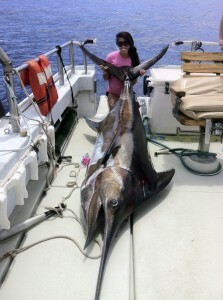 This is why you should you choose Chupu for your next sport fishing trip. In this day and age every charter boat has a website and the internet is flooded with fishing forums and other resources for you, the angler, to get information and we love it! Technology has made our job of marketing and advertising even easier. We don’t have to run around saying we are the best, everyone else does it for us. Spend a little time comparing the catches posted online from other boats in our harbor. Take a look at the size, quality and cleanliness of the boats. Read what other fishermen have said on unsolicited fishing forums. It’s a no-brainer. We have the largest, cleanest fishing charter boats in Haleiwa with the most updated equipment, full-time professional crew and the best record of catching fish on the North Shore of Oahu. Our return clients will agree we continually outfish the competition, day in and day out, rain or shine, twelve months of the year. The reputation of our boats is well known. And that’s why they are return clients. Take a look at our photo galleries for pictures of what our clients have caught lately. The seasoned offshore fisherman as well as a newcomer to the sport will be in impressed. 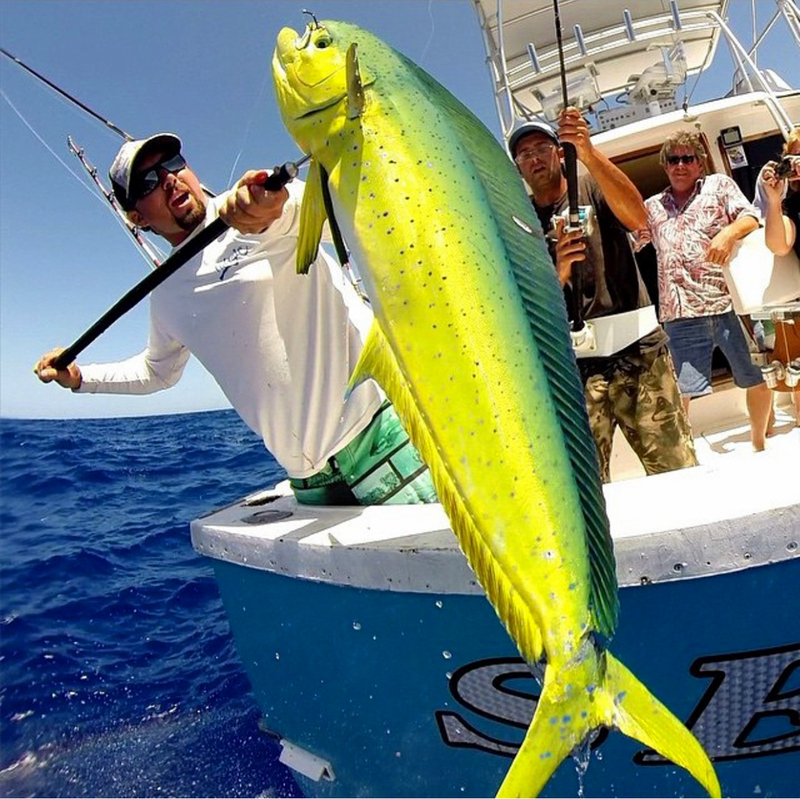 And whether it’s full on big game heavy tackle, live bait standup style fishing or a combination of the two, we have a fishing trip in Hawaii tailored to meet our customers needs. It’s time for you to experience the feeling of pulling back on a fishing rod with a Pacific Blue Marlin (A’u) that could weigh over 1,000 pounds. Have you ever wanted to go fishing for hard hitting giant Yellowfin Tuna (Ahi)? Have you ever been tied to the back of a freight train??? That feeling is closest to what offshore fishing on the North Shore of Oahu with us is like. Fishing anywhere else will never be the same after you see a monster fish that weighs more than you do attack your bait and then take to the air with an amazing aerial display of jumps or heads for the depths all awhile taking 400 yards off your reel in a matter of seconds. Sound like your kind of action? Then Haleiwa is where you need to fish, call today to book your once-in-a-lifetime charter fishing trip! One of the best things about sport fishing on Oahu’s legendary North Shore is that on any given day there are only a few charter boats on the water. 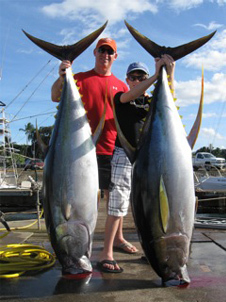 There is awesome year-round fishing for a variety of game fish in Hawaii. Pacific Blue Marlin (A’u), Striped Marlin (Naiaragi), Shortbill Marlin (Hebi), Wahoo (Ono), Dolphin Fish (Mahi Mahi), Yellowfin Tuna (Ahi), Big Eye Tuna (Ahi Po’onui) and Skipjack Tuna (Aku). All of these game fish are considered pelagic (deep sea) edible fish and many of them roam in huge schools often followed by giant flocks of tropical sea birds. On any given day when offshore fishing in Hawaii, you will see an abundance of marine flora and fauna. Picture yourself in the middle of the deep blue Pacific Ocean exploring the coast line of a 2,000 mile island archipelago. It’s an ocean oasis and a sport fishermen’s heaven. Beautiful Mahi Mahi at gaff!